Nexus phones tend to be in extremely high demand just after release, but right now Google has one that's shipping in two days. 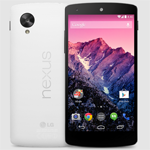 If you order the white version of the Nexus 5 32GB at the moment, you can get it considerably faster than any of the other models... yes, perhaps even in time for Christmas. The Play Store shows it shipping in 1-2 days, meaning that UPS would be speeding it to you by Thursday at the latest. The black 32GB model "leaves the warehouse by December 11th," as does the 16GB white model. Order the 16GB black model and it might not leave the warehouse until December 13th. All of them are in stock, so these dates might get pushed back as more of the phones are ordered. Conversely they might be bumped up if LG is able to push through a larger shipment. Either way, it might be worth it to spend the extra 50 bones on a 32GB upgrade to get the Nexus 5 in your hands all the faster - you're not likely to see a new model discounted at any retailers or on the secondary market. Of course if all you want is a cheap, high-end phone, Motorola will be selling the "nearly Nexus" off-contract Moto X at Cyber Monday prices on Wednesday and next Monday, matching the Nexus 5 on price for 16GB and 32GB models. The Moto X has already been given an update to Android 4.4. If you're going after a Nexus, hurry: I'm sure the shipping will be pushed back in a matter of hours.